In real environments it is often difficult to obtain a collection of cases for the case base that would cover all the problem solving situations. Although it is often somewhat easier to generate potential problem cases that cover the domain tasks, acquiring the solutions for the problems captured by the cases may demand valuable time of a busy expert. 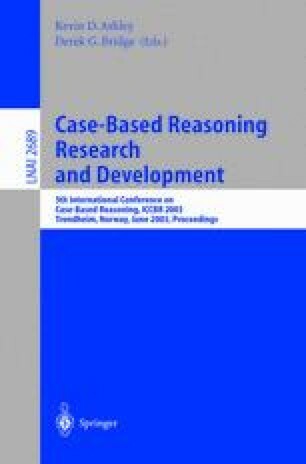 This paper investigates how a Case-Based Reasoning system can be empowered to actively select a small number of useful cases from a pool of problem cases, for which the expert can then provide the solution. Past cases that are complete, containing both the problem and solution, together with partial cases containing just the problem, are clustered by exploiting a decision tree index built over the complete cases. We introduce a Cluster Utility Score ClUS and Case Utility Score CaUS, which then guide case selection from these clusters. Experimental results for six public domain datasets show that selective sampling techniques employing ClUS and CaUS are able to select cases that significantly improve the accuracy of the case base. There is further evidence to show that the influence of complete and partial cases utilised by these scores needs also to consider the number of partitions created by the case base index.